Post last updated January 13, 2019. One of the most infuriating “questions” thrown at vegans sounds something like this: “Why do you care about animals when there are HUMAN BEINGS suffering all over the world? !” This is infuriating for many reasons, of course: It assumes that one cannot care about and work to help both human and non-human animals; it assumes a speciesist distinction between humans and animals; it is often “asked” by speakers who themselves are not doing much to help humans or other animals. Plus, it’s never really a question; it’s a goading comment designed to rile up the vegan target. But despite all this, there’s actually a kernel of relevance to the question. If your veganism is founded on ethics, on a desire to reduce suffering and not take part in suffering as far as is possible and practicable, then caring about your fellow humans and striving to reduce their suffering should also be important to you. It’s not that you have to do it all, but that you should be conscious of suffering and work against it and the systems that encourage it when possible. Which all leads me to my point: that we as vegans should probably be a little more ethically conscious in stores other than the grocery store. Specifically, when we’re buying clothing. It’s no secret that the clothing industry—especially the fast-fashion industry—is notoriously horrendous in terms of human rights and worker safety. The horrific 2012 garment factory fire in Dhaka, Bangladesh, which killed 117 people, is a particularly poignant example of what can happen when safety isn’t a priority, but the day-to-day injustices and inhumane working conditions in the garment industry are no less important. All these facts, when taken together, form a pretty strong case for caring a little more deeply about—and putting a little more thought into—one’s clothing purchases. 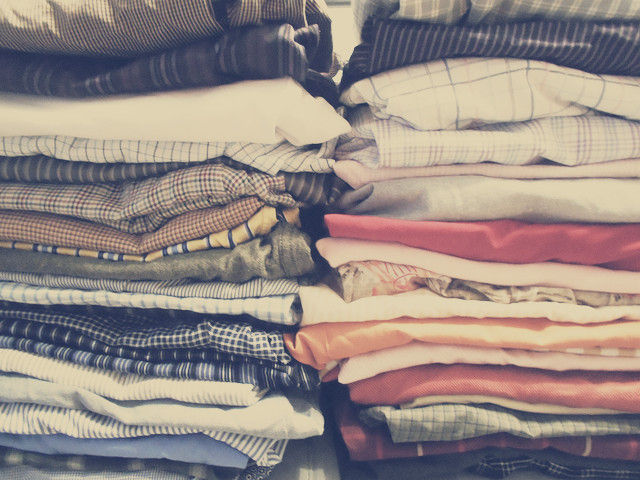 Buying fewer pieces of clothing and keeping them for longer is a great place to start. These are just a few things you can ask and look for as you find brands that you think might produce their wares ethically. In a nutshell, transparency counts! And don’t be afraid to email companies and ask questions—it’s good to keep them accountable and let them know that people want more ethical clothing options. Do they mention sustainability or ethics on their website? (Scroll down to the bottom of their homepage and check for a link to a dedicated page or read through the FAQ to start.) If there’s no mention at all, there’s a good chance that this retailer produces their garments in sweatshops and/or has not even signed on to any labor/working condition agreements. Retailers that are actually committed to ethics, fair trade, and/or sustainability almost always explain why they hold these values and how they put these values into practice. On the other hand, beware of statements so vague as to be essentially meaningless. Greenwashing is real, and if a brand can’t give concrete examples of its commitment to ethics and/or sustainability, it’s probably just paying lip service to those ideals. Do they list sources for any materials? For example, some sustainable producers use recycled polyester, and they’ll always call that out. Other ethical brands use “waste” products or use only environmentally-friendly dyes. if a brand doesn’t give any information, the information they do have is likely not going to meet your ethical standards. Do they include the exact country in which the product was made? Many retailers will just list “imported” next to a product, which can indicate a lack of transparency. On the other hand, most ethical companies will tell you exactly where each product was made. And although you might see something like China and immediately assume the worst, note that some factories do follow higher welfare standards and pay a living wage. A truly transparent and ethical company will explain how they choose their factories and will often perform in-person checks. 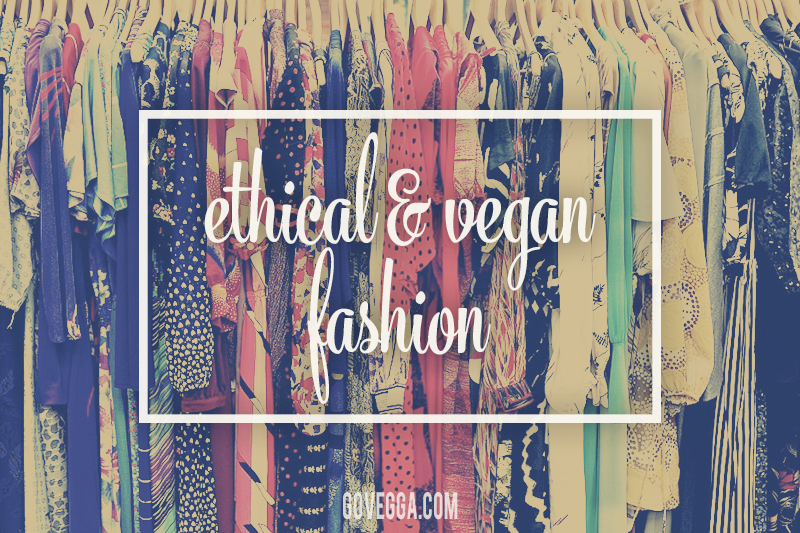 So, with all this in mind… how do you find ethically made vegan clothing? Let me help. Editor’s note: I’ve updated this post as of 03/29/18 with a few new options, and I’ve marked one company that is now defunct. Why I love it: I practically lived in Alternative Apparel’s super-soft athleisure-focused pieces last summer: I’d get home from work and immediately change into a sports bra, tank top, and shorts or yoga pants and head outside, either to work in the garden or sit with a beer and a book in the backyard, soaking up the sun. They have an impressive range of mostly casual pieces for men and women, mixed in with a few slightly dressier pieces that could fit into a business-casual wardrobe. 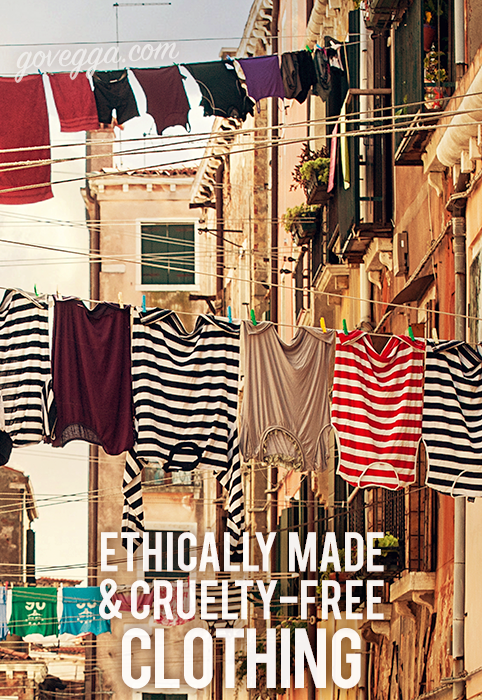 Why it’s ethical: Alternative Apparel’s statement of social responsibility ticks all the boxes: Eco-friendly fabrics? Check. Recycled materials? Low-impact dyes? Fair labor conditions? Check, check, and check again. Their base in LA is even certified green, meaning they encourage and promote small-scale environmentally friendly practices, like ride-sharing and using green cleaning products. And they use almost exclusively non-animal fabrics; you’ll find the occasional woolly garment, but it’ll be labeled clearly. What it’ll cost you: At full price, AA’s clothing tends to hit the middle of the spectrum, with a few items skewing pricier. $28 organic cotton T-shirts are pretty comparable to similar brands, but the $112 flannel shirt-dress seems a bit much. Note that many of the more expensive items are the private-label brands AA carries. Look for their own house brand for more affordable options. Want a discount? AA is great for discounts! I’ve never paid full price for anything. First check out the sale section for discounts that hover around 50%, then head over to the last-chance section for truly bargain-bin prices. Sizes and colors tend to be limited, so hop on a sale whenever it’s offered. Be sure to sign up for the mailing list to be the first to know about their (frequent) sales, and note that shipping and returns are always free in the 48 contiguous states. New customers can use my referral link for 20% off a purchase of $30 or more. Why I love it: For whatever reason, many ethical clothing companies seem to shy away from color. (I think it’s because many of these companies want to offer eminently neutral—and therefore versatile—basics.) Not American Giant. This brand embraces color, from vibrant red to jewel-toned emerald to dusty purple. It also offers an impressive range of mostly casual basics: Think waffled henleys, simple T-shirts, and an oft-praised hoodie. I have a simple grey sweatshirt from AG that’s both warm and comfy, but I’d love to try their ponte pant/legging—it looks like the epitome of comfort and perfect for traveling. Why it’s ethical: The name should be a dead giveaway: everything is made in the USA with American-grown and crafted cotton. Plus, the company offers free returns on any item at any point in time for any reason, a quality guarantee that demonstrates how strongly they stand behind their products. And because all products are cotton (along with some new nylon offerings), you don’t need to worry about wool or silk sneaking in! What it’ll cost you: Although not the cheapest brand on this list, American Giant offers a relatively low price for fully made-in-the-USA goods. Women’s T-shirts will run you anywhere from $25 to $40, while their much-lauded hoodie is about $90. Sales are rare but not unknown, so keep an eye out. Want a discount? Like I said, sales are infrequent, but new customers can score 15% off with my referral link. Why I love it: This woman-owned, Boston-based company focuses on basic, foundational pieces. Although it’s designed with a capsule wardrobe in mind, these basic pieces will fit into anyone’s closet. I particularly appreciate the muted tones and fairly timeless shapes. The company will also reimburse you up to $15 if you need to get a piece tailored to fit, which is a nice gesture. Plus, Brass uses “real models” to demonstrate how their clothing fits on a variety of body shapes. Sizes run from XXS-XXL at present. Why it’s ethical: The women who run Brass ensure that their fabrics are high-quality and their garments are well-constructed so that they’ll last—these are not items you’ll throw out in a year because they’ve developed holes. They design their clothing here in the USA and manufacture it in Hangzhou, China, at two factories that they visit fairly regularly. Most fabrics are vegan, though they do use silk occasionally. What it’ll cost you: These are not inexpensive clothing items; expect to pay $20-$30 for a T-shirt and ~$90-$125 for a dress. That’s because they’re truly built to last. Check out the last-chance room for occasional deals: I bought the grey sweater dress on sale last year and it’s absolutely a winter staple for me. Want a discount? New customers get $10 off by signing up for the Brass mailing list—just scroll down on the home page and enter your email address at the prompt. Why I love it: Similar to American Giant, PACT focuses on cotton basics. Unlike AG, whose wares are eminently casual, PACT offers a broader range of goods, from undies to cute dresses. It’s a particularly great choice if you want simple basics (socks, undies, tights) that are fairly made and don’t cost a fortune. I particularly love their tights, which are thicker than regular tights without venturing into legging territory—perfect for winter! This cute pocket dress is also one of my favorites. It’s soft, super comfy, and a great length (I’m 5’5″ and an XS hits just above the knees). Plus, the pockets fit even the largest smartphones! And at $29.99, it’s really a steal. Why it’s ethical: The PACT motto is “Change you can wear,” and a good-for-people, good-for-the-planet ethos drives their work. Everything is sweatshop-free, ethically produced, and features certified organic cotton (which uses less water to manufacture than conventional cotton). What it’ll cost you: One of the most affordable brands on this list, PACT won’t break the bank. Yes, you’ll pay more for a pair of socks or underwear here than you would buying a six-pack at Target, but that’s the trade-off of purchasing fairly made goods. And honestly, PACT’s prices are pretty much as low as you’ll find for ethical basics. T-shirts run an extremely affordable $15.99, while a four-pack of basic crew socks is $22.99. Want a discount? Use my referral link and get 20% off your first order! Then sign up for PACT’s mailing list for frequent discounts (they recently offered 30% off winter favorites). And watch out for their Black Friday/Cyber Monday sales—you’ll get some amazing deals! I scored an $8 T-shirt one year. Why I love it: Yes, this is a bigger company than most others on my list, but I had to include it for its commitment to fair-trade and sustainability. You can read their full sustainability statement here, but here’s the short version: PrAna is committed to using sustainable materials (think hemp and recycled polyester), reducing waste (no plastic-wrapped clothing when you place an online order! ), offering fair-trade certified clothing (since 2010! ), ensuring that they know where their materials come from (thanks to traceability projects), and avoiding harmful pollutants (by partnering with bluesign to meet high environmental standards). I own a few prAna pieces (yoga pants, everyday pants, swimsuits, and a winter jacket) and they’re all high-quality, investment pieces that I think will last me years. On top of all that, prAna has an amazing commitment to customer service—they want you to love your clothing and wear it till it wears out. I purchased a pair of pants and wasn’t 100% happy with them (they were just a little big) and found I wasn’t wearing them that often. Six months after my purchase, they were willing to exchange them for a smaller size at no cost to me! One thing to note: As of summer 2018, PrAna has started to incorporate more plus sizes (up to a 3X currently). They don’t offer plus sizes on all items, but it’s a step in the right direction. Why it’s ethical: Well, see above! PrAna walks the walk when it comes to ethics. Note that they do use some animal products in cool-weather clothing, mostly down (ugh, though it’s allegedly responsibly sourced), wool (often recycled), and the occasional suede elbow patch (why?!?). Luckily, everything is clearly labeled online so you won’t get any unwelcome surprises when your order arrives. What it’ll cost you: PrAna is not cheap, but they do have a robust sale section with seasonal discounts up to 50% off. That’s my preferred way to shop! Want a discount? Check out the aforementioned sale section and sign up for emails—you’ll be the first to know about shipping offers or new discounts! PrAna is also available on Amazon, so you might be able to take advantage of Prime shipping deals for certain products. 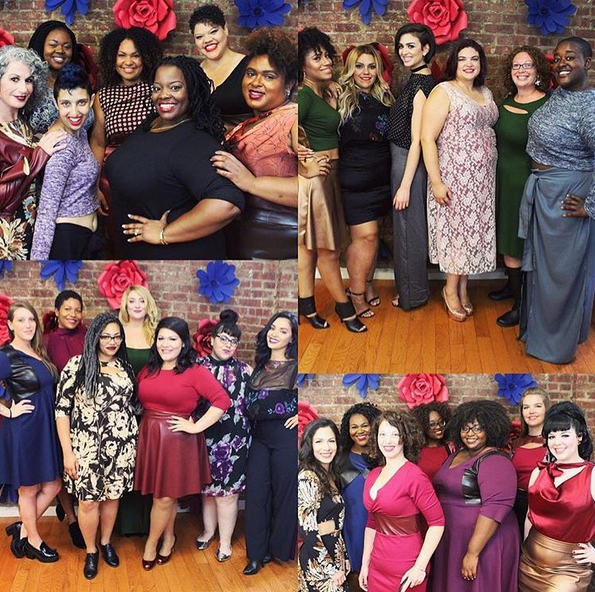 Why I love it: When it comes to body-positive style, SmartGlamour stands alone. This brand is amazing in so many ways. It’s a woman-run, New York-based company; in fact, owner, designer, and general powerhouse Mallorie Dunn makes all clothing items to order. So while the company offers straight sizes in a truly amazing range (XXS-6XL+), you can customize any aspect of your garment (including the fabric!) to fit your body and sense of style. And Dunn is 100% committed to body positivity; the SmartGlamour Instagram account features real women of all shapes and sizes. (Check out the photo above for proof.) This inclusivity doesn’t end at size and shape; Dunn features women of color, women of all ages, and women all over the LGBTQ+ spectrum, including trans women. Reading her Instagram captions fills me with joy because of how overwhelmingly positive and inclusive they are—this is what America looks like, and I’m so happy to find a brand that’s committed to outfitting every single woman! Why it’s ethical: Because everything is handmade in NYC, no shady labor conditions are contributing to your cute new dress! Aside from the occasional well-labeled wool, all fabrics are vegan—in fact, I first found SmartGlamour while perusing the #veganfashion hashtag on Instagram! What it’ll cost you: For handmade (and often customized) clothing, SmartGlamour is surprisingly inexpensive (probably because Dunn keeps overhead low too). A classic (and classy) fitted sheath-style dress will run you $65, while a drape-y cardigan costs $40. Want a discount? Check the sample sale section and follow SmartGlamour on Instagram to see additional sample materials as soon as they’re available. Why I love it: The driving idea behind Sotela is disarmingly simple: women should have a few pieces of clothing that will always fit, regardless of weight fluctuations or shape changes. Founder Hanna Baror-Padilla wanted to address this issue after severe digestive issues left her so bloated and uncomfortable that most of her existing clothing didn’t fit. She decided to design a line of simple, basic dresses with a decent amount of give to allow for changes in size and shape. In practice, that means that Sotela’s dresses don’t match up with typical sizing. Instead, you’ll find just three sizes, each of which corresponds with a set of straight sizes. The largest size (3) fits traditional sizes 14-18. Why it’s ethical: Baror-Padilla is committed to using environmentally friendly fabrics, such as modal, which can be made from the pulp of renewable beech trees. All items are produced in Costa Mesa, California. If you’re looking for ethical clothing that’s also made in the USA, this is a great start. What it’ll cost you: Dresses start at $100, although a sample sale running right now offers a $65 swing dress. Want a discount? Enter your email address in the popup window for free shipping. Why I love it: It’s the OG high-fashion, all-vegan, cruelty-free brand! Founder Leanne Mai-Ly Hilgart started the company in 2008 as a way to unite her fierce belief in animal welfare with a product that would appeal to a fashion-forward crowd. And it most certainly does. Although Vaute Couture is perhaps best known for its uber-warm winter coats, Hilgart has expanded her line to include dresses, sweaters, shirts, and even swimsuits—all vegan and all super stylish. Back in 2011, I split the cost of the original Belden coat (similar to this one, but with a slightly different fabric) with my mom as an early Christmas present when it went on sale—and I’ve been wearing it ever since. It’s a beautiful, well-fitting coat that got me through a few killer Wisconsin winters! Why it’s ethical: Let me count the ways! For one, Vaute Couture is a 100% vegan brand, so you can always trust that the materials are cruelty-free. Vaute Couture uses sustainable materials (recycled, organic, or even waste-free) and makes its coats ethically in New York City by teams paid a living wage. What it’ll cost you: This is easily the most expensive brand on this list: at full price, expect to spend about $400 to $600 for a snow- and weather-proof coat that will keep you toasty. Sweaters and skirts will run you upwards of $150, in line with similar high-fashion brands. Want a discount? The good news: Vaute Couture frequently offers end-of-season (and even pre-season) sales, with discounts of up to 50% off. (That’s how I could afford my jacket; in those days, Vaute Couture funded its winter runs by pre-selling coats.) Yes, you will still pay a pretty penny, but you’re purchasing an investment piece that will last. Six years later and my coat is going strong! Encircled: Conceptualized as an answer for female travelers who aspire to carry-on-only adventures, Encircled offers versatile staples that help you travel light. For example, the much-lauded Revolve dress can be styled as a dress, tunic, and regular top, as can the Chrysalis cardi. All designs incorporate closed-loop processes, meaning no wastewater is introduced into the environment—and everything is sewn in Toronto, Canada, by well-paid employees. So why didn’t I include them in my list of favorites? Put simply, I don’t have any personal experience with the company! I also remain a bit skeptical of multi-wear clothing; if I don’t wear some fancy twisty dress in my everyday life, odds are slim to none that I’ll want to wear something like that while I’m traveling. I tend to think the concept of multi-wear styles is more novelty than practicality. That said, there are a few reviews out there that speak very highly of Encircled’s products, and I’d love to give their products a try! Want to save? Use my link to get $20 off your first order! Everlane: The darling of ethical fashion bloggers everywhere, Everlane was one of the first web brands to focus on transparency. They share the cost breakdown of each item so you can see exactly what their profit margin is, and they forge relationships with their factories to ensure working conditions are fair and safe. So why didn’t I include them in my list of favorites? Well, they do use a LOT of animal products, from silk to cashmere to wool to leather. They also don’t have anything that’s certified fair-trade, as far as I can tell. And finally, I find many of their styles to be puzzling: a recent email hawked a pair of bizarre wide-legged cropped pants as “the most flattering pant you’ll ever try,” which is just absurd. Their boxy shapes seem unfriendly to many body types (nor are their models inclusive of all body shapes and sizes), and their persistently drab shades just feel bland (and that’s coming from someone who loves neutrals). That said, I have one plain black v-neck T-shirt I really like, and it was well-priced. Note that the clothes run big—I had to order an XXS! Good Apparel: A newcomer to the world of ethical/sustainable women’s fashion, Good Apparel is the brand-new house line of Good Clothing Company. The latter is a Massachusetts-based production partner that works with designers who want an ethical, made-in-the-USA option for producing their designs. Good Apparel creates small-batch collections, releasing new ones every 2-3 months to buck the traditional fashion calendar. They focus on sustainable, locally sourced fibers, avoid waste by producing small batches, and pay their staff living wages. So why didn’t I include them in my list of favorites? The company is brand-spanking new, and there’s not much press on the quality of their clothing (though it should be top-notch). I also find their designs a bit puzzling and perhaps too fashion-forward for the average consumer ($138 split-leg pants?). I appreciate what they’re doing and imagine they’ll be a great fit for a very specific audience. I am not that audience, however. Seamly: Founder Kristin Glenn wanted to create clothing that’s made to last, that doesn’t support unethical labor practice (it’s all made in the USA), and that supports the environment by using primarily “waste” products. So why didn’t I include them in my list of favorites? Here’s the catch: Seamly is currently not offering new products, but is relaunching in spring of this year with a new line of “modern staples.” However, this means that their existing inventory is on sale for 50% off! Pickings are somewhat slim, but take a look. I’ll update this list when Seamly officially relaunches. Cost: I won’t deny that ethically made clothing costs more than fast fashion. But if you’re already paying more for your vegan almond milk than you’d pay for cow milk, you’re familiar with the trade-off: truly ethical products don’t come cheap. As you switch to a more ethical wardrobe, you might need to rethink your shopping strategy: Gone are the days when you can hit up the mall for two-for-$15 T-shirts; instead, you’ll typically spend more on a single shirt! Personally, I’ve enjoyed paring down my wardrobe to figure out what I really need and to find pieces I love, pieces that are versatile and that will last. I fully acknowledge that this practice might not be as attainable for anyone who is truly struggling with money and needs to prioritize other necessities. That’s OK. Just do the best you can. Thrifting: Much of my wardrobe right now is secondhand. I don’t feel bad about purchasing so-called fast fashion when (1) it’s used and (2) it fits a specific gap in my closet. (For example, I have a few cotton sweaters from cheap brands that I bought at thrift stores. They’re lasting quite a while, and they were way more affordable than purchasing a $75+ organic cotton fair-trade sweater.) There’s an argument that buying items like this, even secondhand, feeds into the market for those items existing in the first place, but for many people, thrifting is an affordable way to fill your closet without directly supporting unethical companies. Tip! Set up an eBay search for ethical brands in your size. I’ve gotten a handful of items this way. If you prefer new items, check out what Amazon has to offer. For example, you can find Amazon’s PrAna items here, and can sometimes score a better deal than buying directly from them. Sizing: I tried to note which brands on this list offer a wide range of sizes, but the unfortunate reality is that many ethical brands don’t cater to my larger sisters. I know that I benefit from the privilege of being thin, and I’m 100% on board with the health at any size movement and with fighting the gross fat-shaming culture that exists in the vegan movement. I’ll update this list if I find great ethical brands that also want to clothe bigger women. On chasing perfection: Once you learn about the horrors of the fast-fashion industry, it can be tempting to throw everything out and start anew. Slow down; that’s not sustainable! Don’t worry about perfection or making sure that every single item in your closet is immediately sustainable and ethical and fair-trade and and and and everything else. Do what you can. The perfect is the enemy of the good. Woman-centric? It’s entirely possible that my inherent bias as a ciswoman who wears mostly clothing designed for women means I’m just missing out on ethical male fashion, but I do think that there’s a whole lot more going on in this space for women than for men (especially when it comes to vegan fashion). And that’s a shame. I would love to see more unisex clothing, or even options targeted toward a more androgynous style. From AlterNet, details on the sustainability and and environmental issues inherent in modern clothing production. Also linked above. From NPR, a look at the problems inherent in fast fashion and how corporate-driven “recycling” efforts could be problematic. Also linked above. P.S. Another great way to support ethical, independent makers is to shop on Etsy! 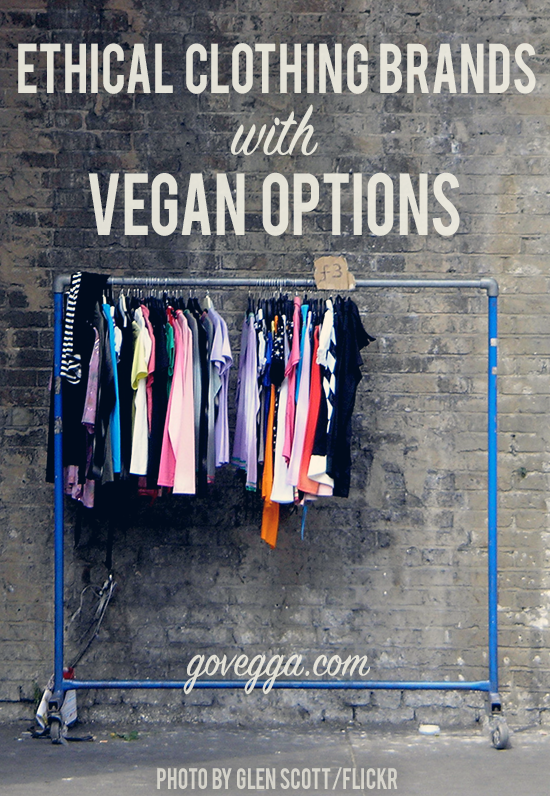 Check out my list of cruelty-free clothing on Etsy here. Like this post? Let me know and I’ll work on guides to more specific types of ethical vegan apparel (undies, shoes, etc.). And please share your other favorite brands! Thoughtful and informative. I’m proud of your commitment to what you believe in. Love ya! Kelly, what a great list! I appreciate what appears to be the result of lots of hard work and research to compile such a thoughtful list. And I’ve never been so moved by a website or clothing company as I was in SmartGlamour. Just beautifully affirming! Anyways, thanks for the list and introducing me to some clothing companies I hadn’t yet heard of. In the spirit of sharing, I thought I’d mention a couple of vendors I’ve used and liked in the past. – Maggie’s Organics (http://www.maggiesorganics.com/): heavy on the socks, but they’ve also got a small collection of thoughtfully crafted and sourced apparel for folks of all ages. An old stand-by! – Organic Cotton Plus (https://organiccottonplus.com/): if you’re looking to venture into the world of homemade clothing or sewing items, this site is a great fabric source! They focus on organic, ethical, and transparent product sourcing and production. That’s it for now! Thanks again!! Oh, and I’m glad you also appreciate SmartGlamour’s inclusiveness. It’s so rare and wonderful! Bothering you with another comment. ;-) I just came across http://www.rawganique.co and am impressed with their vegan, sustainable, hippie-esque options. They seem to focus on sustainably sourced and produced cotton, linen, and hemp clothing and lifestyle products for the whole family. I haven’t bought any of their items yet, but I hope to soon! Wow, so many different options! And affordable, too. Thank you for sharing!